Maintaining good footcare is essential if you spend a lot of time on your feet. If you are a hiker, trekker or backpacker the health of your feet will impact on your body in a much more positive or negative way. Just one small blister can ruin your exploring experience so it is essential that your feet are properly cared for at all times. The best way of ensuring your feet avoid becoming a potential problem, when hiking or spending time outdoors, is to make sure you choose suitable, comfortable and protective footwear. The correct type of footwear will provide essential support, flexibility of movement and little risk of causing blisters or other painful injuries. If a hot spot does develop it is important to treat the area before it becomes a blister. Treating blisters as early as possible – using a moleskin patch – will help reduce painful pressure. It is also important to let your feet breathe as much as possible, particularly if you are spending a long time walking or hiking. Allowing your feet to breathe, by taking your boots or shoes off every few hours, will help minimise the chances of discomfort and sore feet. 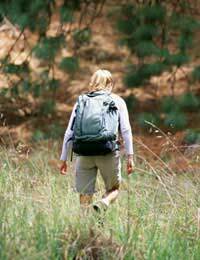 Seasoned hikers and walkers should ensure they carry footcare products that can be used to reduce pain and discomfort. A supply of moleskin and antibiotic cream takes up very little space in a backpack but can make a huge amount of difference if feet become painful or sore. If you have an established foot problem that has a tendency to flare up - for instance Plantar Fasciitis, which causes inflammation and stretching of the tissues and is very painful - it is important that you are aware of procedures that help minimise pain. You will therefore have to plan for regular stops to soak feet to alleviate pain and discomfort. Any hardening of the skin on the foot can be carefully removed with a nail file or knife, so it is important to pack tools that you think you may need to access. A small travel-sized wet wipe can also provide a huge amount of comfort to hot, tired and painful feet so packing a handful in your backpack is worth considering. On your return from your excursion it is important to treat your feet with care. Bathing them in a foot spa or bowl of scented, warm water will help remove any discomfort. Any hard skin can be removed with the use of a pumice stone or file. For a more pampering treat applying a mild dermabrasion cream to your feet will slough off all dead skin cells, leaving the skin feeling softer and more supple. Pre-medicated socks, that contain a softening solution, are also available and can be worn to remove rough, dry patches of skin on the feet. After carefully drying your feet all blisters and wounds should be treated accordingly. Applying a heel smoother, to help reduce the risk of cracked heels, is also a good idea.